The bridge between Sibelius and the Sibelius 7 Sounds sample library (v7.1.2). This template is NOT for VDL! Automatically receive special bundle pricing with our Sibelius Bundle Builder! Bring yourself up to speed with what’s contained in the Sibelius 7 Sounds sample library. This informational package is available as a free download from the Sibelius site. Get it here: Sibelius 7 Sounds User Guide. 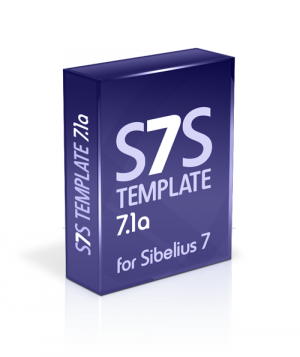 S7S_Template_7.1a.sib – Sibelius file with all the S7S Template 7.1a instrument definitions. S7S_README_7.1a.pdf – Installation and setup instructions, how to read the Maps file, and more. S7S_SoundSet_7.1a.xml – Sound set file that Sibelius uses to trigger correct S7S sounds in Sibelius Player. S7S_SoundSet_7.1a_Lite.xml – Lite version of sound set that loads less samples – useful on slower machines. S7S_Maps_7.1a.pdf – Dictionary charts, mapping diagrams and input maps that show how all the S7S instruments are defined – including percussion. S7S_PlayTest_7.1a/ – Folder with S7S PlayTest 7.1a files. Don’t have Sibelius? Get Sibelius now! This template falls under our SINGLE-USER License. We also have Multi-User Licenses available. Please use our Contact page to request a quote.